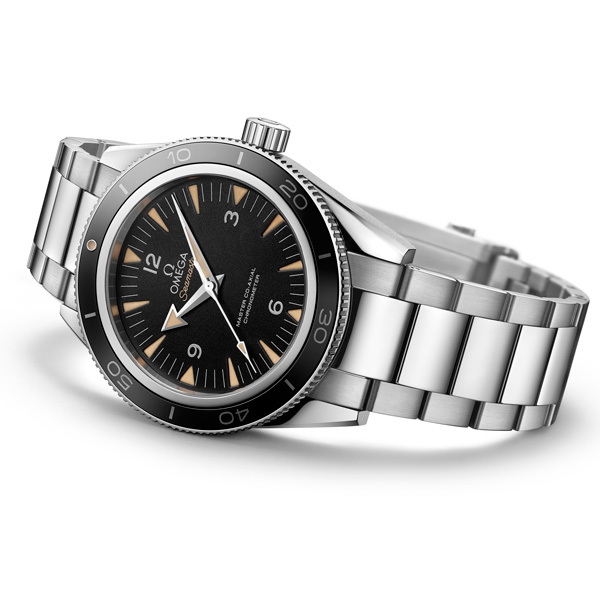 In 1957, OMEGA introduced its Seamaster 300 – a watch designed specifically for divers and professionals who worked underwater. The unidirectional rotating bezel and diving scale, along with the combination of a black dial, lighter indexes and large hands and numbers, made it possible for divers to read the time in a variety of light conditions whether they were on land or below the ocean’s surface. 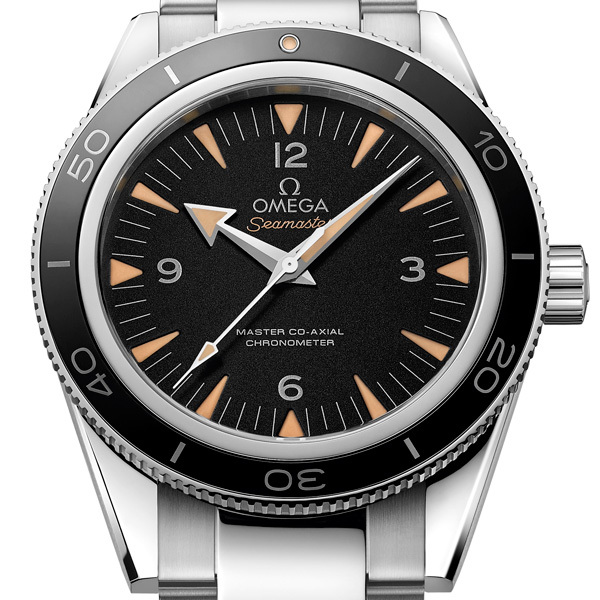 More than half a century later, the Seamaster 300 is reintroduced in a completely upgraded and enhanced form, prepared to equip a new generation of adventurers on land and in the oceans. The 41 mm Seamaster 300 is available in an impressive selection of metallic materials including stainless steel, 950 platinum, grade 5 titanium and 18K Sedna™ gold. Bicolour options pairing grade 5 titanium and 18K Sedna™ gold or stainless steel and 18K Sedna™ gold are distinguished by their timeless, understated aesthetic appeal. The black ceramic dial of the Seamaster 300 features transferred dial elements that are produced using a combination of gold and palladium. The white gold colour is enhanced by a patented process that involves a high temperature treatment; the curving contour of the indexes is created by the enamel under-layer. The 18K white gold central hour, minute and seconds hands are coated with “vintage” Super-LumiNova and the hour and seconds hands emit a blue light as do the recessed hour markers. The minute hand is also coated with Super-LumiNova but emits a green light. The stainless steel timepiece feature a sand-blasted black dial which complements the polished black ceramic bezel ring decorated with a Liquidmetal® diving scale. Recessed hour markers are coated with “vintage” Super-LumiNova which emits a blue light as do the rhodium-plated hour and seconds hands; the minute hand and the dot on the bezel are coated with Super-LumiNova that emits a green light. One of the most brilliant wristwatches in the Seamaster 300 collection features a case and bracelet made from OMEGA’s 18K Sedna™ gold – an exclusive material that was introduced at Baselworld in 2013. Its sand-blasted black dial is adorned with facetted 18K Sedna™ gold hands and white transferred dial indications. 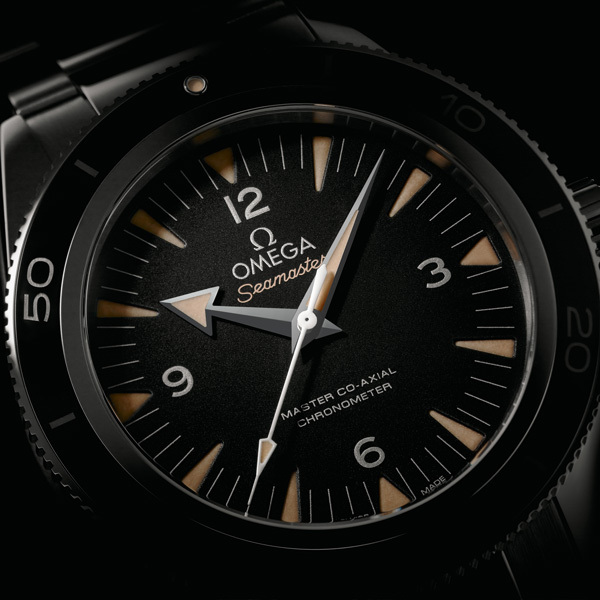 The polished black ceramic bezel ring is enriched with an OMEGA Ceragold™ diving scale. 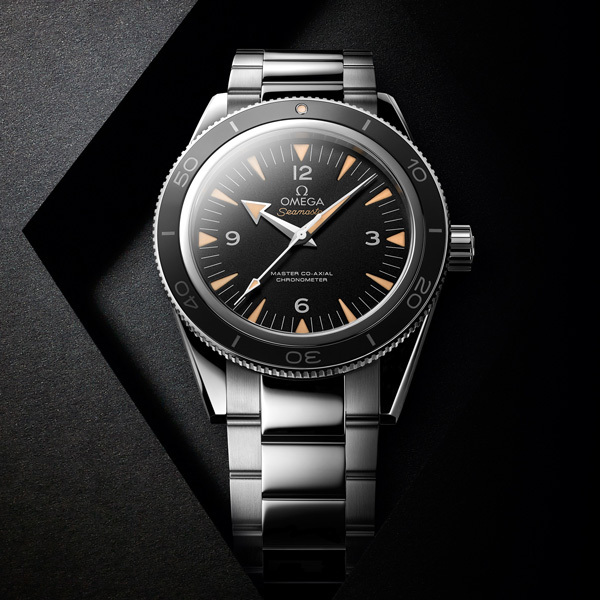 With the Seamaster 300, OMEGA is proud to introduce two calibres in its new family of high-quality mechanical movements. 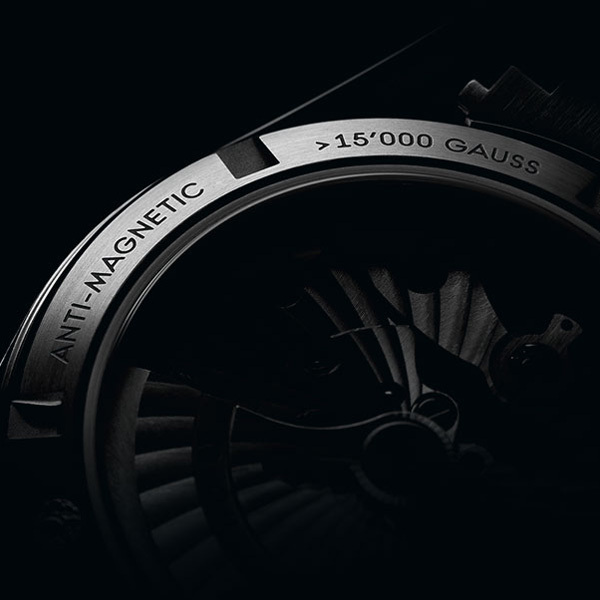 The Master Co-Axial calibre 8400/8401 not only boasts the same accuracy, precision and reliability as its Co-Axial predecessors but also features our revolutionary anti-magnetic technology, which ensures that the Seamaster 300 – or any timepiece equipped with a Master Co-Axial movement – resists magnetic fields greater than 15,000 gauss (1.5 tesla). The officially certified chronometer is water resistant to 30 bar (300 metres / 1000 feet) and is offered with a full four-year warranty. The caseback of each timepiece is engraved with “Si14”, “ANTI-MAGNETIC > 15’000 GAUSS” and, depending on what alloy the diving scale is made of, “Liquidmetal®” or “Omega Ceragold™”. A domed scratch-resistant sapphire crystal allows an unobstructed view of the movement inside. The Master Co-Axial calibre 8400 equips the bi-colour, stainless steel and grade 5 titanium models while the Master Co-Axial calibre 8401, with its special luxury finish, powers the models crafted from 18K Sedna™ gold and 950 platinum. Bracelets of each timepiece are fashioned with OMEGA’s patented rack-and-pusher clasp, which is adjustable to six different positions making it possible for the watch to fit over the sleeve of a diving suit. The bracelet is adjusted by releasing the clasp, pressing the “push” button and sliding the inner clasp to the desired fit. 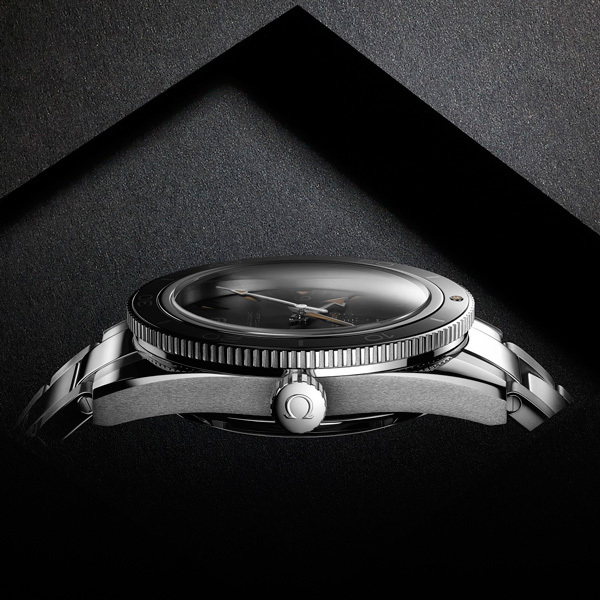 Like its historic predecessor from 1957, the Seamaster 300 features a symmetric case and a unidirectional rotating bezel as well as a dark dial, lighter indexes and big hands and numbers for easier reading in various lighting conditions. Self-winding movement with Co-Axial escapement for greater precision, stability and durability. Resistant to magnetic fields greater than 15,000 gauss. Free sprung-balance with silicon balance spring, two barrels mounted in series, automatic winding in both directions to reduce winding time. Bridges and the oscillating weight are decorated with exclusive Geneva waves in arabesque.